Whether you're a recurring Pokémon Trainer, a Pokémon GO devotee looking for new adventures, a veteran who's been away for a while, or someone completely new to Pokémon (where have you been for the last couple of decades?) – Pokémon Sun & Moon have something for all. Here follows an introduction to the World of Pokémon, and an outline of what guidance the Bulba Handbook can offer on your travels to the Alola region in Pokémon Sun & Moon. The Pokémon series focuses on creatures known as Pokémon, as well as their inhabited world, full of legends, tales, and adventures. Pokémon coexist with humans and can be caught, trained, and used in battles and other activities. Trainers, along with their Pokémon, travel across diverse lands aiming to make their dreams become reality. In the Pokémon games, you are a Pokémon Trainer who is just starting on their Pokémon Journey. At the beginning of this journey you receive a starter Pokémon, of which there is three to choose from. You also receive a Pokédex, a digital encyclopedia that registers every Pokémon you meet and catch. Your main goal is to defeat a number of powerful Trainers across the region to become the Pokémon Champion, though there are often sidequests along the way. During your journey you also have to deal with a villainous team, who often wishes to harness Pokémon for their own nefarious deeds. Along the journey you will meet many Pokémon, which you can either defeat, or catch with a Poké Ball. Pokémon are typically found in one of five manners: encountering them in tall grass, finding them in caves or ruins, going fishing for them, surfing on water, or trading with an NPC. You can carry six Pokémon with you at a time. If a Pokémon is caught while you already have a full team, the Pokémon can be sent to a PC box for safekeeping. To become stronger to be able to continue your journey, you have to train your Pokémon, by defeating wild Pokémon and other Pokémon Trainers. 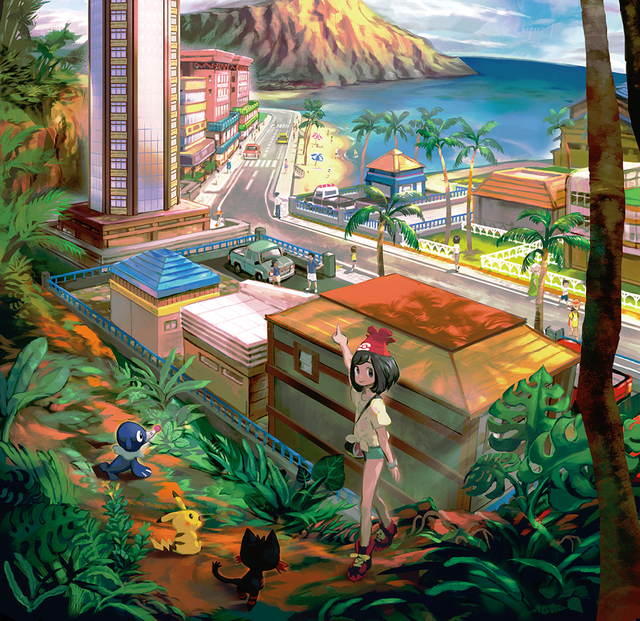 The Alola region is the setting of Pokémon Sun and Moon. It is made up of four natural islands and one artificial island. The Alola region is a popular resort destination and attracts a lot of tourists from other regions. In Alola, humans and Pokémon coexists in a very close relationship, and a culture has developed that is different from other regions. Pokémon Trainers in Alola can take up the island challenge; a rite of passage consisting of trials on each of the four main islands. Each trial has a Captain who provides guidance to Trainers undertaking a trial. At the end of each trial, Trainers must face a Totem Pokémon in a so-called SOS Battle. The final trial on each island is called the Grand Trial, where the Trainer must battle the Island kahuna. The goal of those taking the island challenge is to become the strongest Trainer, known as the island challenge Champion. The player's Pokédex is a special model that can be inhabited by a Rotom, called the Rotom Pokédex. Through the Pokédex, Rotom can speak human languages. The Pokédex also acts as a real-time map on the bottom screen on your Nintendo 3DS, showing your location, places of interest, and recommended destinations based on conversations made with NPCs. Z-Moves are a new type of move in which the Trainer and Pokémon’s wishes combine to release their full power. Z-Moves are moves of great power, but can only be used once per battle. In order to use the various Z-Moves, the Trainer has to collect various Z-Crystals in the Alola region. Poké Ride is a new feature whereby you can call on the services of certain Pokémon in order to access areas that you would not have been able to access on your own. These Pokémon are not part of your team, but they may be called on at any time through a Ride Pager. You can scan QR codes corresponding to each Pokémon in the Pokédex, allowing you to register them as Pokémon you have seen. The QR scanner can also be used to receive event Pokémon, such as Magearna. The Poké Finder allows you to take pictures of Pokémon at certain spots, called photo spots. Poké Pelago is a new feature that allows Pokémon that are stored in a PC Box to explore a variety of isles, play on athletic equipment, and enjoy other fun activities. The various islands allow your Pokémon to gather items, discover wild Pokémon, and even raise Pokémon levels and stats. The main difference between the two games is the way time is set. The time in both games is tied to the actual time on your 3DS. However, the time in Pokémon Moon is shifted by 12 hours. This means that if you play during the day, it will be day in Pokémon Sun, but night in Pokémon Moon. 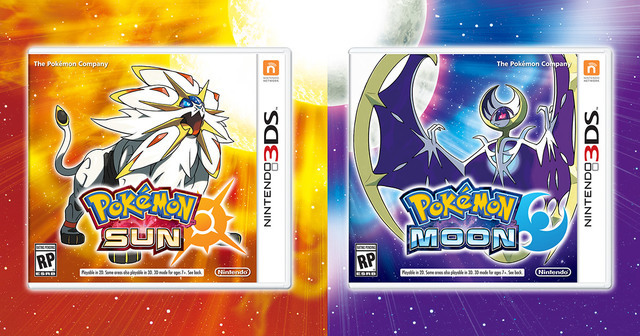 And if you play at night, it will be night in Pokémon Sun, but day in Pokémon Moon. The Ultra Beasts UB-02 Absorption and UB-04 Blade are also exclusive to Sun. Furthermore, if you evolve Rockruff in Sun, it will evolve into Midday Form Lycanroc. The last difference is that the first Totem Pokémon you have to defeat in Sun is a Totem Gumshoos. The Ultra Beasts UB-02 Beauty and UB-04 Blaster are also exclusive to Moon. Evolving Rockruff in Moon will make it evolve into Midnight Form Lycanroc. Furthermore, the first Totem Pokémon you have to defeat in Moon is a Totem Alolan Raticate.